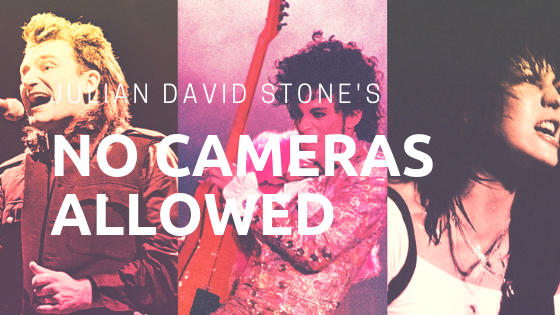 30 years ago, the phrase “no cameras allowed” was more of a guideline than a policy. For Julian David Stone, that line was drawn incredibly thin. In his latest book, No Cameras Allowed: My Career as an Outlaw Rock and Roll Photographer, Stone shares some of his favorite photographs and the unique stories behind them. He wasn’t a normal concert photographer – he didn’t even have credentials to shoot the majority of the shows he did. The first time he was told he couldn’t bring his camera in, he simply stashed it in his socks. This progressed to taping equipment all over his body and ultimately customizing a jacket to hide equipment from security guards. He shot dozens of the greatest acts, many of whom are featured in the book – Prince, U2, the Police, David Bowie, R.E.M., the Ramones, Elvis Costello, the Talking Heads, the Grateful Dead and Joan Jett, to name a few – all from the crowd, capturing exactly what the fans were seeing and the way the band meant the show to be seen. When Prince and Bowie died in 2016, Stone shared his favorite photos he shot of them in the early 1980s and got an overwhelming response from people who were curious about how he had these photos. The book is filled with one-of-a-kind photos and memories of his time spent at concerts and how he eventually started getting work once he built up his portfolio. The craziest part was he had no intention of selling his work or sustaining a career as a concert photographer. His passion lied in filmmaking and was actually going to school to pursue a degree in that when he finally hung up his makeshift camera jacket. No Cameras Allowed is the perfect mix of storytelling and illustration that captures a wide demographic. Getting away with sneaking in camera equipment like Julian David Stone did is impossible these days, but hearing the stories of life as an outlaw photographer mixed with photos of some of music’s biggest legends is absolutely worth sharing.